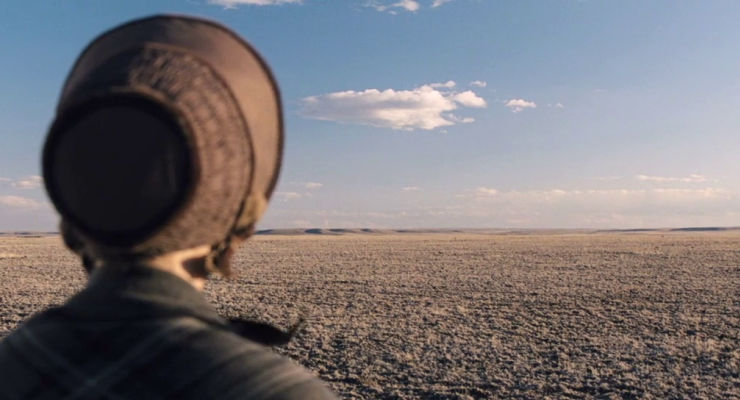 THE HOMESMAN takes place in the stark isolation and danger of the Nebraska Territory in the 1850s. Three pioneer wives are driven to insanity by the bleak, thankless conditions of a woman’s life on the prairie. A hardy spinster undertakes to guide the trio back East for the care that’s unavailable on the frontier (and away from their miserable husbands). She’s aided by a scruffy vagrant: en route, they deal with the harsh elements of natural and human nature. It’s beautifully directed by Tommy Lee Jones (he co-wrote), who most ably stars in another of his unofficial string of Dogged Journey roles that seem to appeal to him—Lonesome Dove, The 3 Burials of Melquiades Estrada, No Country For Old Men. He does a thoroughly unsentimental, acutely sensitive job behind and in front of the camera. Co-starring is Hillary Swank as the kind, intelligent, desperately lonely heroine. 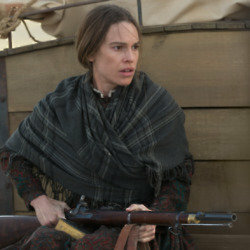 Like Jones, Swank adds more luster to her own career pattern of portraying Resilient Women On a Mission. Completely unaffected and deglamorized, she’s quietly marvelous. The emotionally destroyed women are played by Miranda Otto, Grace Gummer and Sonja Richter; rich cameo roles go to Meryl Steep, John Lithgow, Tim Blake Nelson, James Spader and Hailee Steinfeld. No false notes. Beautifully shot by Rodrigo Prieto, mournfully scored (thankfully not a bit overdone) by Marco Beltrami, the script and delivery seem fully authentic. The 2014 work is 122 minutes long, was well received critically and did negligible box-office of $2,600,000 against its cost of $16,000,000. With Barry Corbin, William Fichtner, Jesse Plemens, David Densik. A sleeper that if there is any justice ought to develop a following over time.